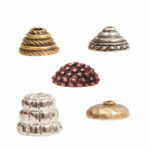 Nunn Design® Beadcaps aren’t just for beads! Add them into the center of a bezel, use them as a cone to make a tassel, turn them upside down and create a flower accent. 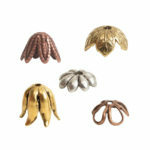 Check out some examples on our blog: Featuring New Beadcaps From Nunn Design. Watch a video on Using Beadcaps.